SAP R/3 has become one of the most widespread Enterprise Resource Planning software products in the world. It is the application that is at the core of every company's business. With the incorporation of Web-initiated e-business transactions in SAP R/3, it now has to be available literally all the time. 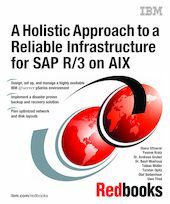 This IBM Redbooks publication shows a holistic approach for a reliable and highly available SAP R/3 infrastructure based on IBM eServer pSeries. It is a collection of knowledge gathered from a team of SAP R/3 basis consultants that have gained their experience over many years by working in numerous projects. This book provides a high-level overview of the SAP R/3 architecture and contains the high availability design criteria that are essential for IT managers and solution architects. It includes tips and tricks for database copies, performance optimization, and troubleshooting. This book also features a wealth of practical information and hints, which are needed during implementation, for IT specialists, SAP R/3 administrators, and system administrators. This book is an invaluable source of information for all professionals that maintain a reliable SAP R/3 environment.